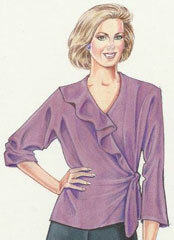 This leaflet shows you how to design and draw both a raglan and a dolman sleeve style. You can use either your Sure-Fit Designs Dress Kit or Shirt Kit. Have fun creating comfortable culottes or divided skirt from your Sure-Fit Designs Pants Kit. Two different style options are given in the directions. Use your Sure-Fit Designs Shirt Kit to design this casual and sporty Jacket. Use denim or other durable bottom-weight fabric, then wear with your jeans or other casual pants. The instructions for this lapel feature can be applied to either your Sure-Fit Designs Shirt Kit or Dress Kit bodice front. The Dress Kit will provide a more fitted 'blazer' look. Call it a leotard, swim, exercise or bodysuit, by any name, the designing technique is basically the same. 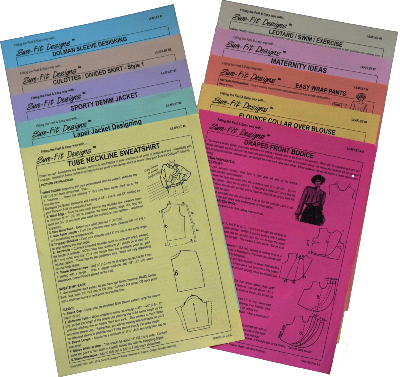 These instructions guide you through getting the right fit for your torso when using the Sure-Fit Designs Dress Kit. These designing instructions offer a bodice front in 2 different styles and how to raise and widen the waist area for early months of pregnancy. These trousers (pants) are so comfortable. The waist edge is widened using a unique side waist extension, then velcro is added at the waist for closure. As your waist changes - just adjust the velcro - providing total comfort!!! This very fashionable blouse is designed with the Sure-Fit Designs Dress Kit. It features a V-neck, flounce collar and is semi-fitted. Shown as an over-blouse but could easily be tucked in. This feminine bodice features a flared/flounced front drape that can be applied to either the Sure-Fit Designs Dress or Shirt Kit. This drape can be extended down into the high hip area resulting in a slenderizing and flattering design. The Petal sleeve offers a split sleeve design. Great for summer wear for children or adults. It's also a particularly adaptive design for the large upper arm. You can also purchase the Fashion Leaflets as part of the Works Combo package found in the Discounted Combo section of the store.